This time of year, there isn't a day where I don't get stung or bit by some insect. Whether it be from accidentally disturbing an ant colony hill while weeding a bed, or pruning shrubs that harbour mosquitos - there's no escape. As autumn approaches, yellow jacket wasps are in a frenzy looking for something sweet or for protein. I dread the wasp season, as I get stung quite often too. We usually carry After-Bite with us where we work, but in one garden area, we don't need to use it. 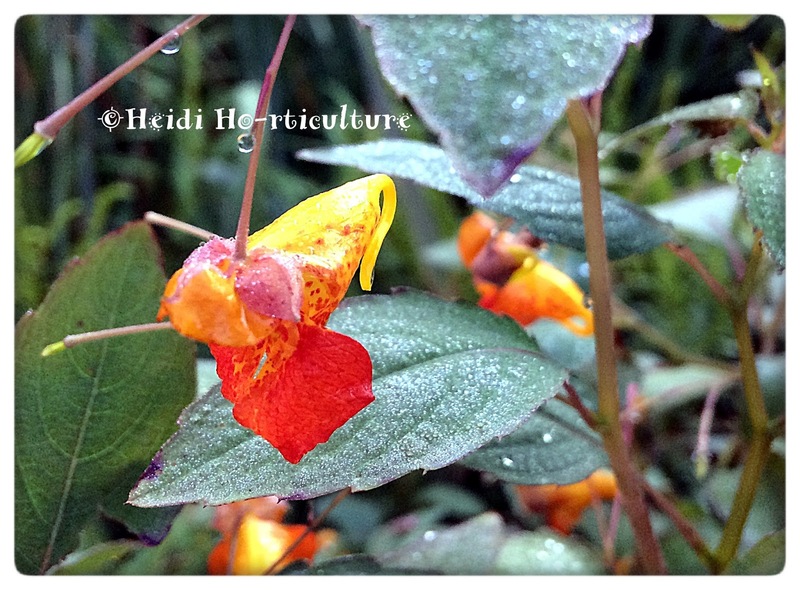 Instead, nature has provided us with a wonderful annual plant called Jewelweed (Impatiens capensis). It's worked so well for me that I had to share. I am thankful for a natural resource that enables us to find a quick solution without running to the first-aid kit. I specifically took photos of this plant in the early hours of the morning, because the dew droplets covering the leaves is why the plant was named Jewelweed. If the sun hits those leaves just right, you get an eye-catching shimmer. 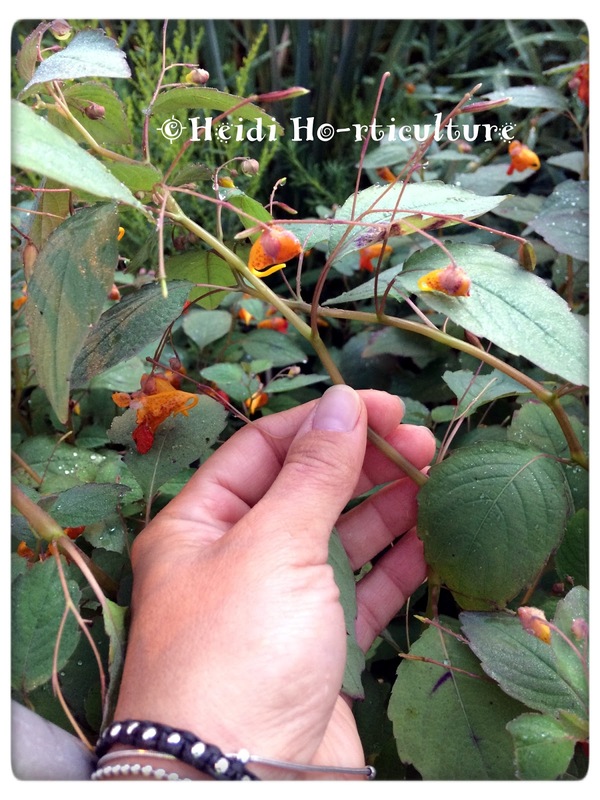 Used medicinally by indigenous people for years, Impatiens capensis leaves contain a compound called Lawsone - which has anti-histamine and anti-inflammatory properties. Just take a few leaves in between your fingers and squish them until the "juice" exudes. Rub the juice and leafy mush onto bites and within a few minutes the sting/bite pain/itch will diminish. Further, Jewelweed can be used as a natural topical treatment for poison ivy! 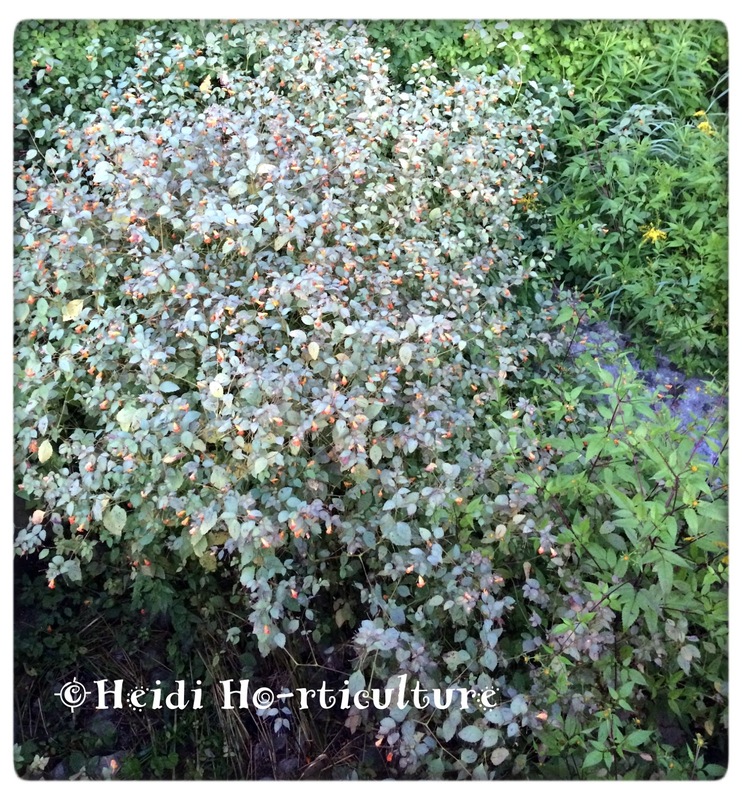 Great for nature lovers, bird watchers and hunters who may come upon poison ivy in the wild. It's ideal to use when you have no lotion or ability to wash off the urushiol oil that gives us rashes. The lawsone in the Jewelweed leaves, acts as a barrier for the skin not to absorb the urushiol oil. 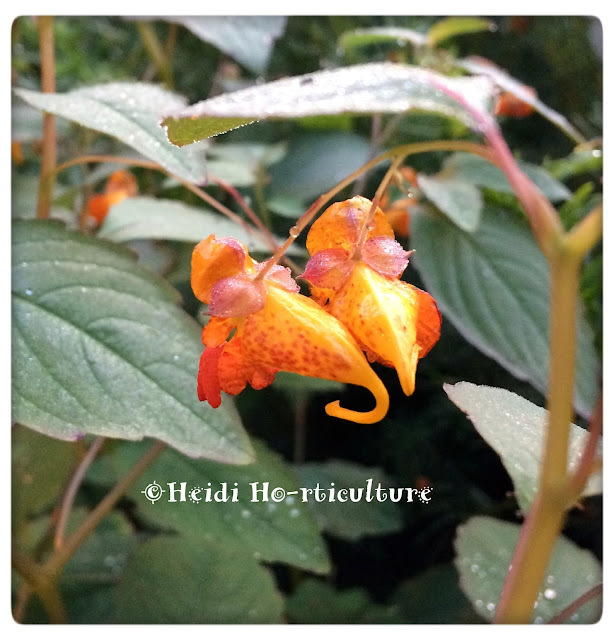 Please look at the link here ---> medical info regarding Jewelweed which describes the plant's ability to treat poison ivy, when you have no soap or water around to clean your skin. 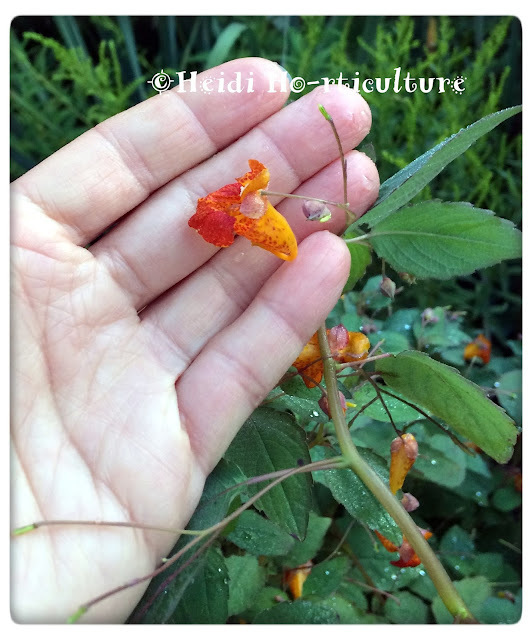 Where to find Jewelweed: they like moist, wetland areas. 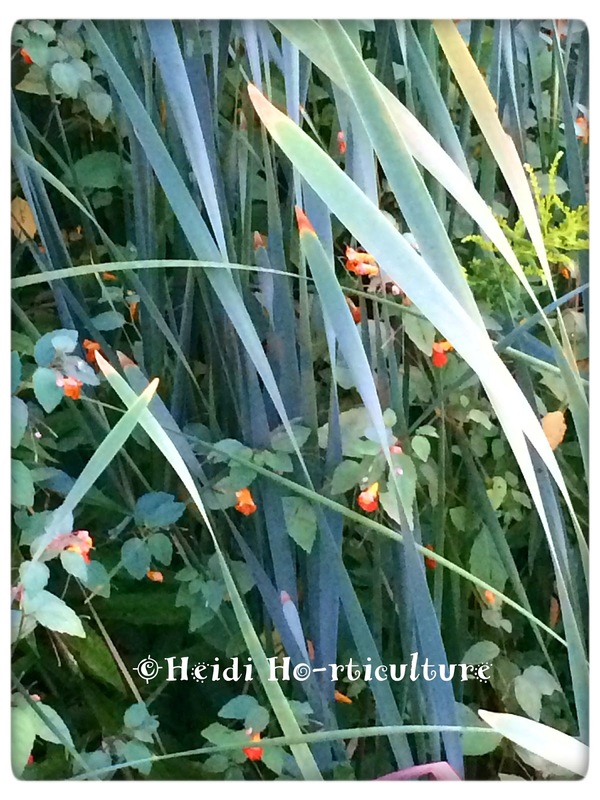 If you see Cattails, then you'll probably find Jewelweed. They are an annual plant which self seeds readily. You never really find just one plant here and there. Instead, a mass - which makes them easy to find. I love it when plants provide an antidote to other noxious plants. The flowers look orange from afar, but here you can see it's a combo of red and yellow that make a clear ID.